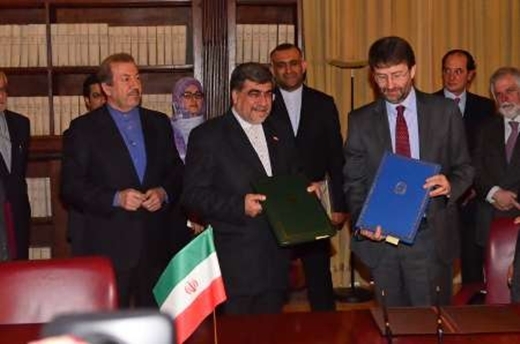 Culture chiefs from Iran and Italy sign a deal to promote bilateral cooperation in a variety of fields including archeology, music, translation and the movie industry. Minister of Culture and Islamic Guidance Ali Jannati and Italian Minister of Cultural Heritage and Activities and Tourism Dario Franceschini inked a memorandum of understanding on cultural cooperation between the two countries for three years. Jannti, who is in Rome at the head of a delegation, met with his Italian counterpart at the country’s Culture Ministry. Referring to high capacities of Iran and Italy in cultural and artistic fields, Jannati said that the MoU includes cooperation in the fields of translation and publication of books into Persian as well as Italian, screening films and holding music concerts in both countries, organizing music concerts in Tehran and Rome and cooperation in the field of archeological excavations. Franceschini, for his part, expressed pleasure over signing the MoU, saying inking the deal will help promote cultural cooperation between the two great civilizations. Underlining good quality of ties between Iran and Italy, he said that the deal also encompasses exchanges between the museums. He also hailed joint request from the international community to adopt further initiatives to counter destruction of cultural heritage by terrorists.